← Gender Neutral Baby Quilt? 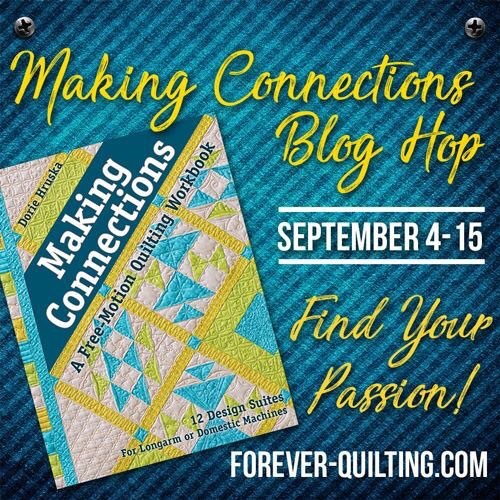 Today is my turn for the Making Connections blog hop! I’ve been looking forward to this book for some time so when Dorie Hruska asked for bloggers to help with the blog hop, I quickly raised my hand. I’m so excited to share my project with you. After reading the book, I immediately had an idea of a pattern I wanted to make to practice her techniques. As I was looking for fabric, I found these scraps and knew they would be perfect for what I had in mind. It didn’t take at all long to piece together this small top out of my hand dyed fabric scraps. Time to quilt it up! For each design in the book, Dorie has a page like this showing the design AND the stitching sequence. This is so helpful! I chose several patterns I wanted to try and sketched them out on paper first. Then I moved to the long arm. Using a highly contrasting thread color was not the best idea, but I wanted you to see the stitching. The squares here finish at 1 1/2 inches. If I hadn’t had some issues with thread shredding, I could have quilted the entire center section with only one start and stop! I marked a diagonal grid on the border and used one of the designs from the center to quilt that. My brain struggled a bit with turning the design on point! Things are pretty uneven there. Here is a look at the back. Some closeups of the front. This last picture shows the truest color. I really enjoyed making this quilt and trying out some of the ideas in the book. I definitely learned some things that I will be using on many future quilts. 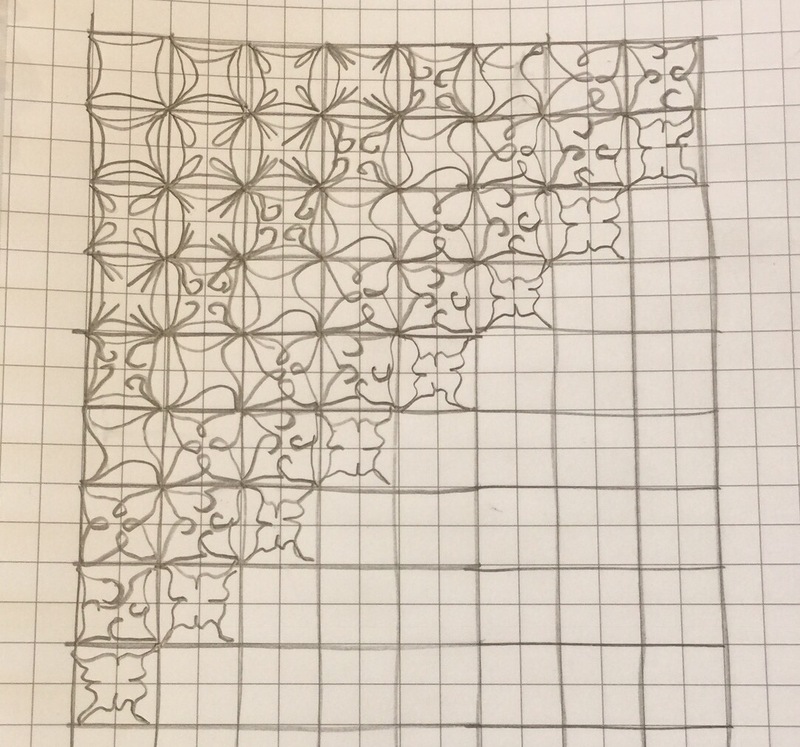 Quilt with fewer starts and stops! 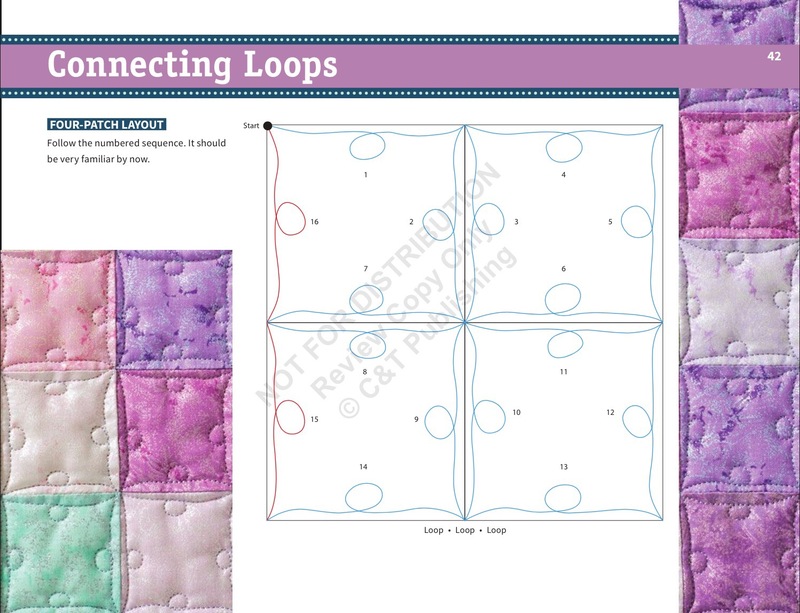 Streamline your free-motion quilting with this workbook full of exercises to build your skills. Easy-to-follow, step-by-step illustrations for each design suite show how to adapt the quilting design for blocks, borders, sashing and all over quilting. Practice each design with a pencil on the included practice pages before stitching by machine, then put your skills to the test on a gorgeous pieced sampler project. A signed copy of the book is available here. Now for some really great news, you can win a free copy of this book from C&T Publishing! Just leave a comment on the post and I will announce the winner in a few days! Winners in the US will receive a hard copy of the book, those outside the US will receive the e-book version. For more chances to win a copy of the book, visit all the stops on this blog hop as listed below. 63 Responses to Making Connections Blog Hop! 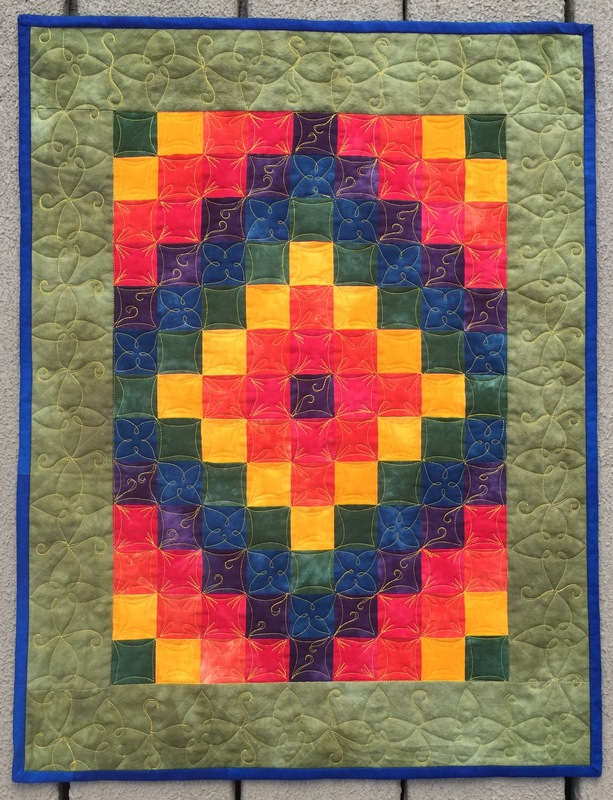 Love your colorful quilt! Thanks for the giveaway! Love the designs. So glad you used contrasting thread so we could see them easily! Stunning is what I say, to think I could learn to quilt like that, wow I need this book. Thanks so much for giveaway. Your quilting is awesome. Congratulations on your trip around the world finish and how brave using that high contrasting thread, You rock! Ps: I’d love to win and use this book! Those colours and the way you put them together is fabulous, and the quilting, swirls, all linked up, the book is a treasure. Love your site! I bookmarked it for future reading! That book sounds very interesting. I’ve enjoyed seeing samples of your using the techniques. Thanks. Your stitching looks great. 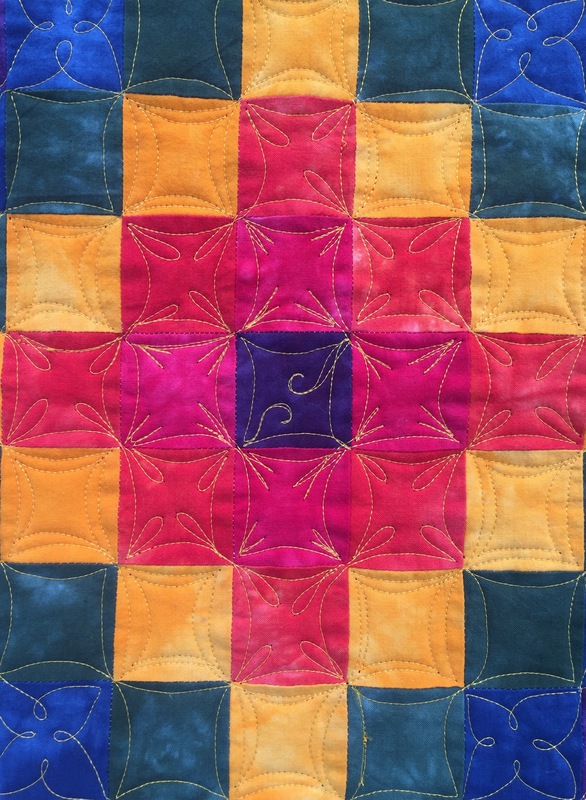 Love the way your quilting sampler turned out – the contrasting thread really shows the wonderful patterns you used!! Katy, I love your sampler. Great job! I like your quilt! The contrasting thread really does show off the great quilting. Wow, your quilting is beautiful! You chose some really pretty designs. Thanks for sharing your quilt with us. It is fantastic! Beautiful quilting!! The book looks like it would be just the thing I need to give me more confidence in FMQ. I struggle with doing anything free hand. Definitely would like to have a copy. Love the little blocks you quilted. This looks like a good book to own. I do love the look of the metallic thread, even though it was a pain. I love the variety of motifs you used. These ideas keep me coming back for more!!! I like the variety tou included in your quilt design. Your quilt looks awesome. I like the back as much as the front. I am always looking for new designs to try. This books looks neat. I like how this book seems to be set up. Taking FMQ bite by bite seems like the practical way and one I could chew on! Your work is gorgeous! This book is so appealing to me. Thanks for the chance to win a copy. 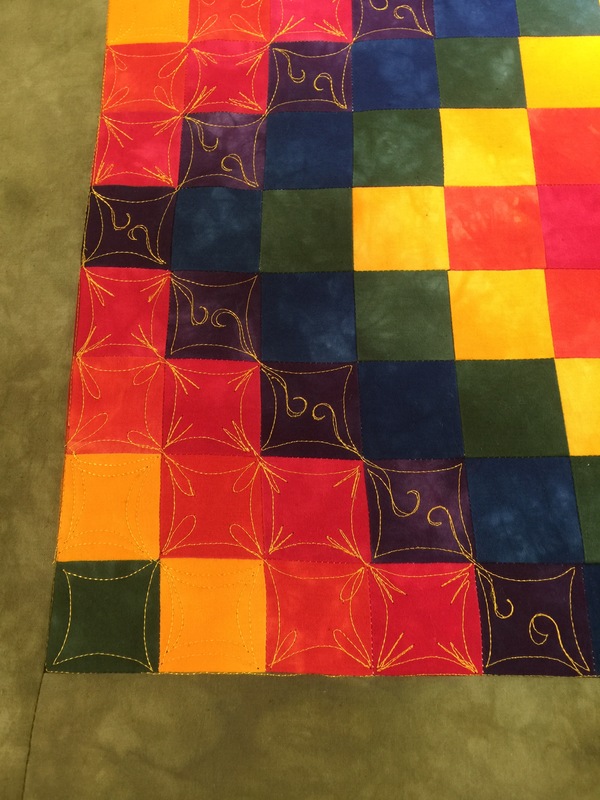 Great job on this quilt, I love the contrasting thread color! I would love to win this book! Oh, I do like the quilting on that gorgeous background! From the bag it’s even better. Thank you for the chance at the giveaway. That is excellent quilting. Beautiful job. Thanks for sharing, and for the chance at the giveaway! That is some really excellent FMQ! Nice job. Thanks for sharing, and for the chance at the great giveaway…looks like there are some great ideas in Dories book!! Love the quilting in the quilt! Wow! You really make that little top sing! I don’t have a longarm, but quite a few of my friends do and I will spread the word about this great new book. Your practice quilt is adorable! I love it! I don’t have a long arm, but breaking it down like that is such a great idea. Love it! 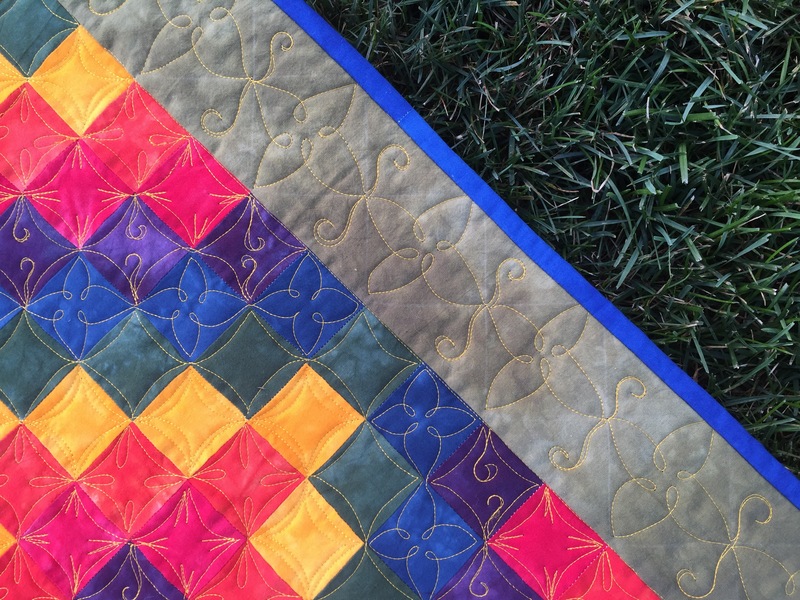 Wow – loved your little quilt – amazing how intricate the quilting looks! You made it look so easy! Thanks for sharing! 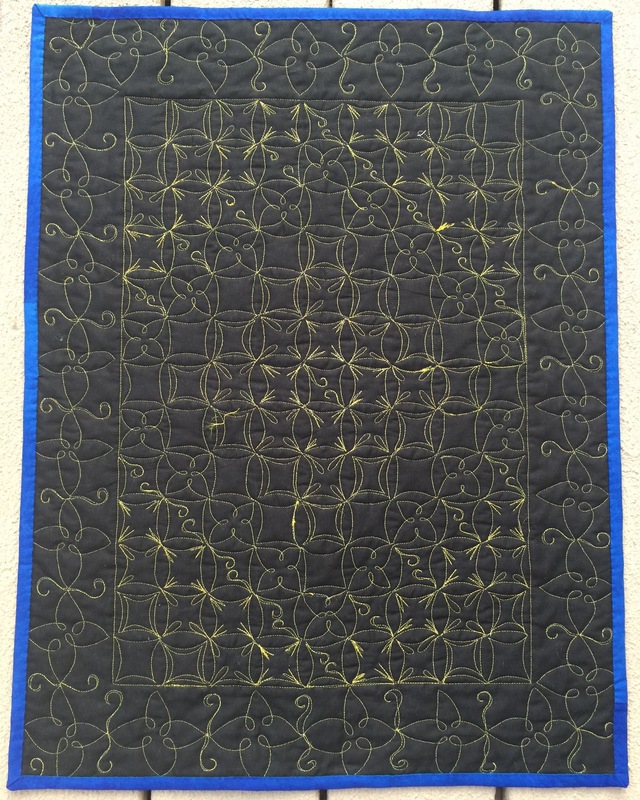 Again – you’re quilting blows me away, Katie! I think I would display the backside! Super job! Continuous non-stop quilting sounds good to me! I lose “the groove” when I have to stop for something. 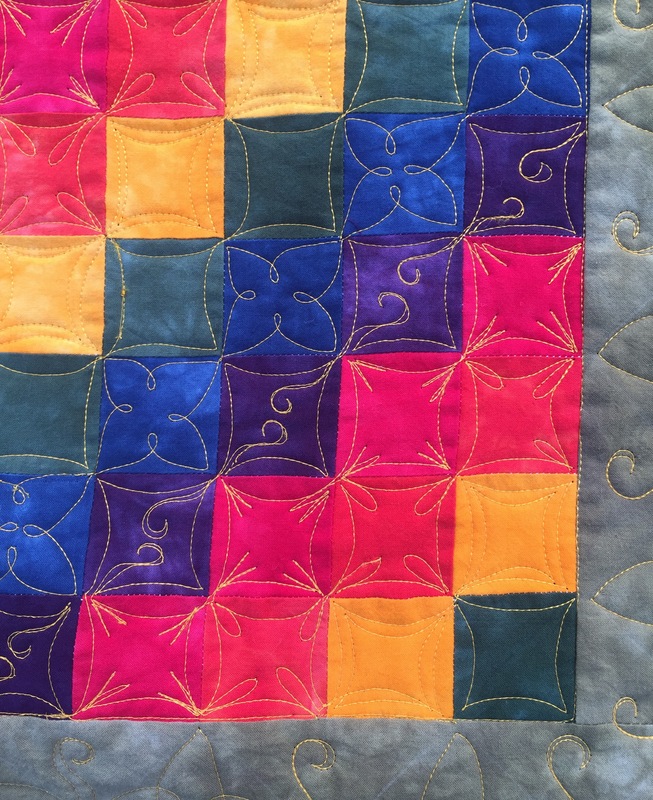 I like the way you included many different variations of your quilting design. Is the book written for both the domestic quilter and the long arm quilter? Amazing Job! Thank you for sharing with us! I am in awe – not sure if I could ever quilt like this, but I’ll have fun trying. Thanks for the invite to your blog! Your quilt turned out great! I can’t wait to learn to use my new longarm! Love your blog! 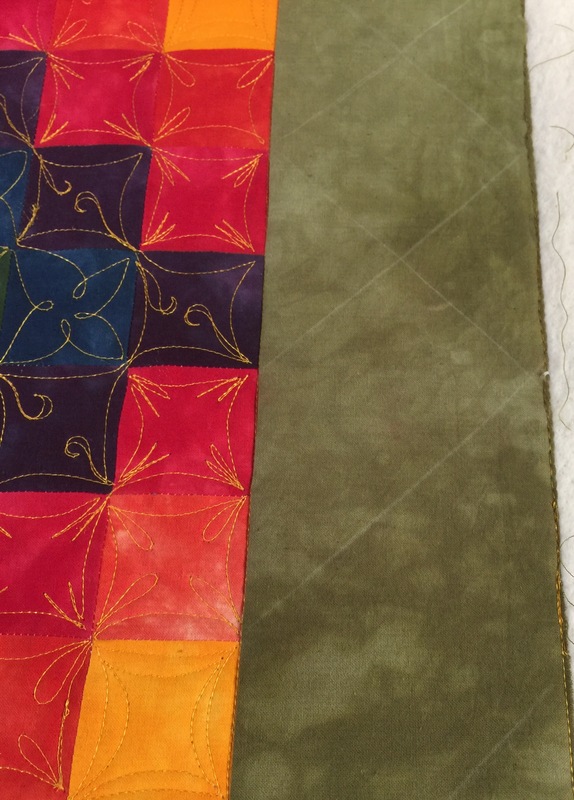 The different quilting designs look great together. 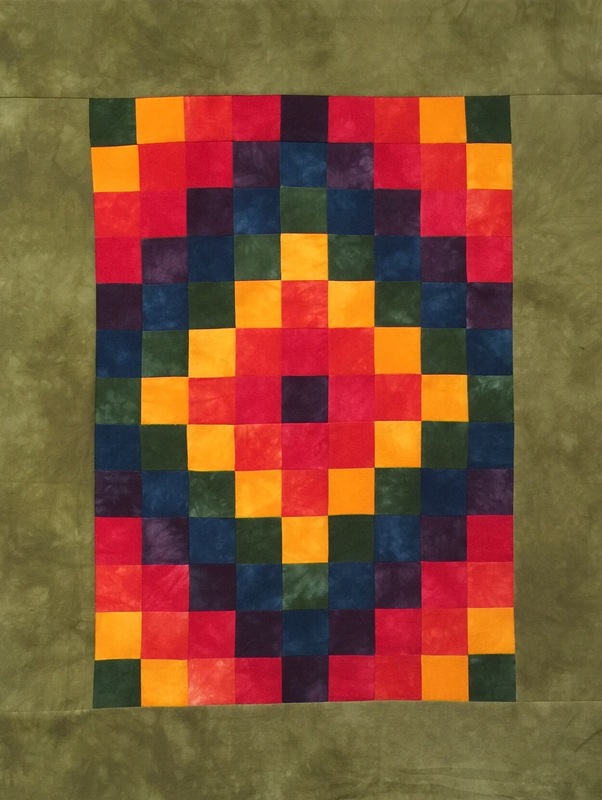 It’s a simple quilt that takes on a new dimension with the variety of shapes. The curlicue on the purple reminds me of the swirls you used on the star block last week. I really like that and will have to give it a try. Thanks for the opportunity to win the book. The book would so helpful to get me out of the meandering rut. Thanks. I’ve been intimidated by the thought of free motion quilting. The book would be so very helpful. 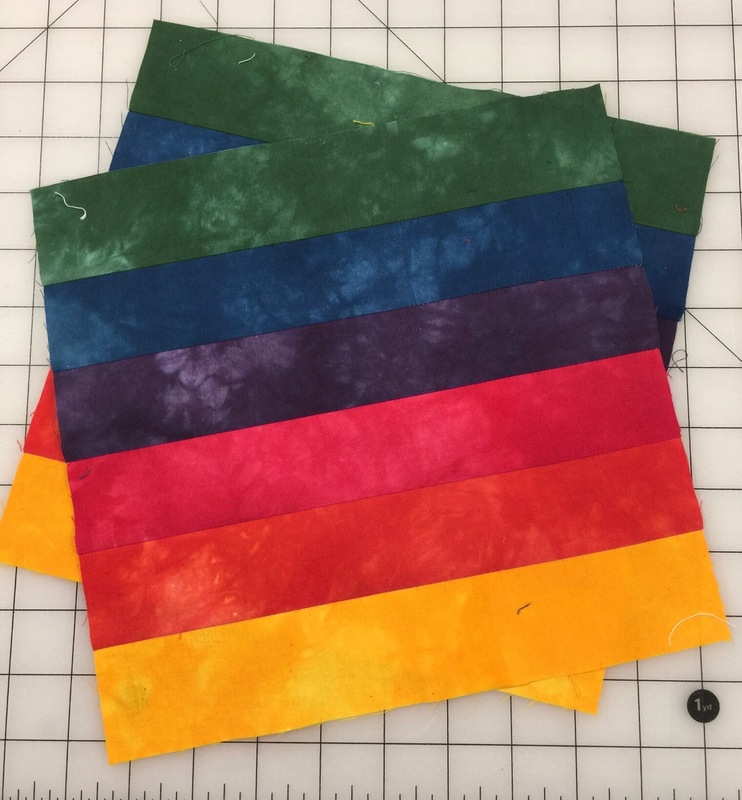 Great job trying out some new quilting motifs! Would love to see this book in person. I think your quilt looks great, both front & back. Your quilting is wonderful. Looks so complicated on point. Looks like a good book to improve my free motion quilting. What an interesting concept for a free motion quilting book. I would definitely like to add this one to my library so Max (APQS George) and I can play! Your quilting looks great! I like the idea of using the grid pattern and continuous quilting. Would love to win a copy….this looks easy to follow. I have a longarm….and am terribly intimidated by it. This would help! Wow beautiful quilting. Great job! Wow on your quilt. I like how you used a different pattern each diagonal row. Beautiful. I like the variety of designs used on your piece. I think this will be just the type of work to explore on my hand dyed fabrics. Did you print out several of the pages to work out your design? Or did you use a sheet protector and dry erase markers, then your camera to remember what you did? With so many designs, I think I might get lost as I tried to remember how I drew them out. Any tips on ‘keeping my place’ would be appreciated. I love your little quilt – the back and the front. Thanks for giving us your thoughts on Dorie’s book. This looks like fun! Thanks for the chance to win a copy of this new book. I love your quilt. I thought of using a contrasting thread for the same reason. To show the stitching. Let’s just say great minds think alike. It looks great Katy. I struggle with directionality when trying new patterns. This may help. Your quilting is beautiful. I need to learn more about machine quilting. I tend to be an in the ditch quilter. Your little quilt turned out very nice. Would love to win the book.